If your kids (or, ahem, you) overindulge in chocolate, you may wind up with a stomach ache. But pets who partake don’t always get off that easy. Dogs and chocolate are an especially dangerous combination — even a small amount can be toxic. While the confection can be poisonous for cats too, they tend to be less attracted to chocolate — perhaps because they can’t taste sweetness. For dogs, chocolate contains two potentially toxic substances — caffeine and a chemical called theobromine — that dogs can’t metabolize as easily as humans. As a general rule of thumb, the darker the chocolate, the more theobromine it contains, so the more dangerous it can be. Unsweetened baker’s chocolate, for example, contains up to 450 mg of theobromine per ounce, compared with milk chocolate which contains up to 60 mg per ounce. Although white chocolate contains even less than milk chocolate, it’s still best to keep it out of your pets’ reach. 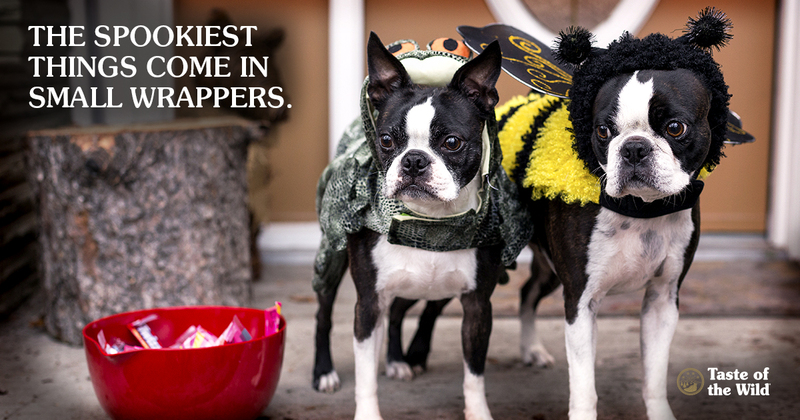 If your dog scarfs up your stash of trick-or-treat candy bars, it’s important to contact a veterinarian immediately. The doctor will want to know what type of chocolate was eaten, an estimate of how much was eaten, your dog’s weight and how long ago the chocolate was probably consumed. A Great Dane that eats a small amount of chocolate may show mild signs, but the same amount could be fatal for a Pomeranian. Timing can be critical, too; if your dog just ate the candy, your veterinarian may be able to induce vomiting before much of the chocolate is digested. After assessing your dog’s condition, your veterinarian may induce vomiting, administer activated charcoal to coat the digestive tract and prevent further chocolate absorption, or recommend additional supportive care. Halloween goodies can contain other substances that are potentially toxic to dogs including raisins, macadamia nuts and xylitol, a natural sugar-free sweetener often found in gum, mints and other candies. Too many sweet, fatty treats can also lead to pancreatitis, an inflammation of the pancreas that may require hospitalization. Since dogs don’t bother unwrapping candy before binging, large quantities of candy wrappers could cause a digestive tract obstruction that could lead to surgery. When in doubt, call your veterinarian or contact the ASPCA Animal Poison Control Center at (888) 426-4435 or the Pet Poison Helpline at 1-855-764-7661. The best plan is to keep Halloween treats well out of the reach of your pets. They can still share in the festivities — just add a few teaspoons of plain, canned pumpkin (with no added spices) to their evening meals. Now, if only it were that easy to keep Halloween treats out of your paws.